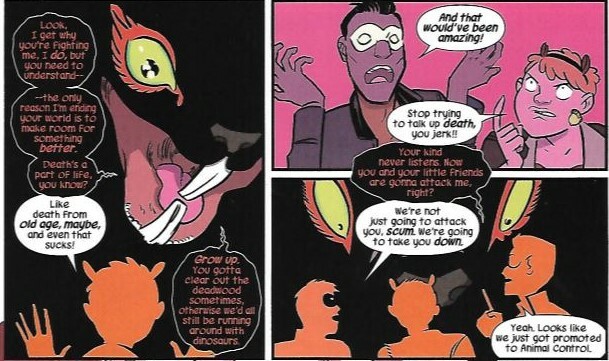 There’s nothing quite as fun as Squirrel Girl. So, Nancy Whitehead is in Asgard with Thor and the Odinson, Squirrel Girl is working with Chipmunk Hunk and Koi Boi, and I’m reading a fantastic comic that I never want to put down. It’s a pretty great day. Nancy is having a pretty great day too, because Loki just showed up and admitted that he maaaaaybe had something to do with Ratatoskr getting out, so it’s great that he’s taking responsibility for that. 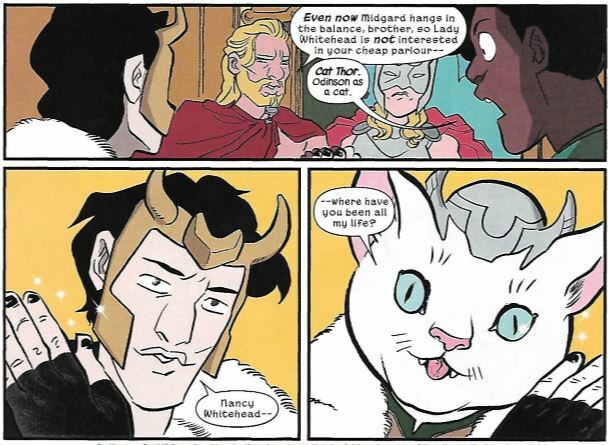 Also, he turned his head into Catthor and is wielding Mewnir, so this issue is phenomenal. Back on Midgard (aka where the party’s at), the animal themed heroes are fighting Ratatoskr and not doing so hot. Ratatoskr uses her mind control on Chipmunk Hunk and Koi Boi, and the two of them attack Squirrel Girl. She lifted Spider-Man’s web slingers back at the Avenger Mansion, so she thwip’s them and Ratatoskr into their respective places. On a less great note; Ratatoskr has given all of NYC the “Squirrel Girl is bad” mind control, so they all set her free and attack. Luckily, right as Ratatoskr is about to get SG all mind controlled, Thor, Nancy, Odinson, and Loki show up with Bluetooth earpieces. They give one to Squirrel Girl, then work together to defeat Ratatoskr. It’s super rad, and I love it. The comic ends with Nancy getting a lesson in squirrel speak, so she can talk to Tippy Toe when they’re together without Doreen/Squirrel Girl. This comic is so adorable, but also powerful I can’t handle it. When Squirrel Girl was trying to defeat Ratatoskar, she told everyone that their insecurities don’t make them bad, they show them what to work on, and in turn, increase power. When you know what you want to improve, it’s easier to become confident and powerful. It was such a great speech. Plus the comic is all about acceptance; they’re all buddies working together at college and as superheroes. I love it. 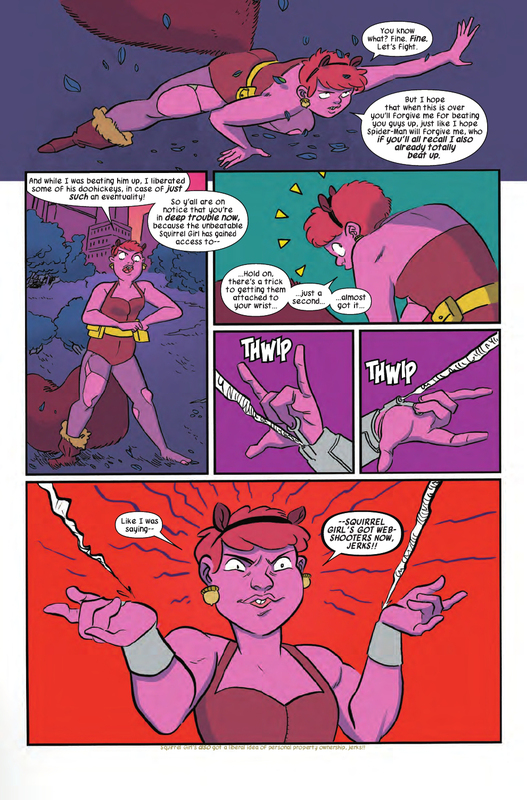 So go read Squirrel Girl, their second #1 comes out next month and it looks pretty dang rad.